honed. 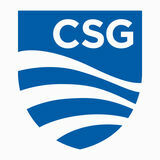 That is why CSG offers many training programs for elected and appointed state officials across the nation. We are proud to partner with state leaders in their dedication to continual learning. Read more about these opportunities here! Each year, the CSG Henry Toll Fellowship, named in honor of CSG founder Henry Wolcott Toll, brings together a group of rising state leaders to Lexington, Kentucky, for an intense week of leadership training. Participants are encouraged to both evaluate and adapt the way they interact with each other and the world around them—setting aside titles, politics and party lines. Designed to help state officials from all three branches take an introspective look at how they view themselves as public servants, colleagues and community members, the program provides a unique experience unlike any other in the nation. 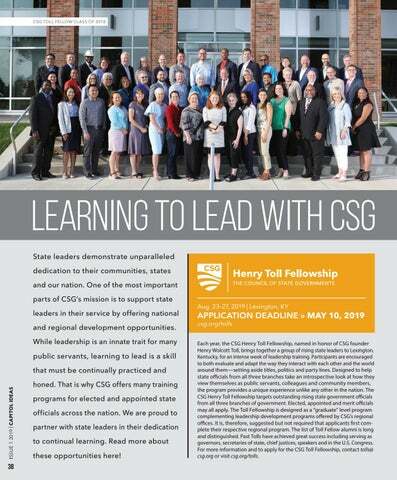 The CSG Henry Toll Fellowship targets outstanding rising state government officials from all three branches of government. Elected, appointed and merit officials may all apply. The Toll Fellowship is designed as a “graduate” level program complementing leadership development programs offered by CSG’s regional offices. It is, therefore, suggested but not required that applicants first complete their respective regional program. The list of Toll Fellow alumni is long and distinguished. Past Tolls have achieved great success including serving as governors, secretaries of state, chief justices, speakers and in the U.S. Congress. 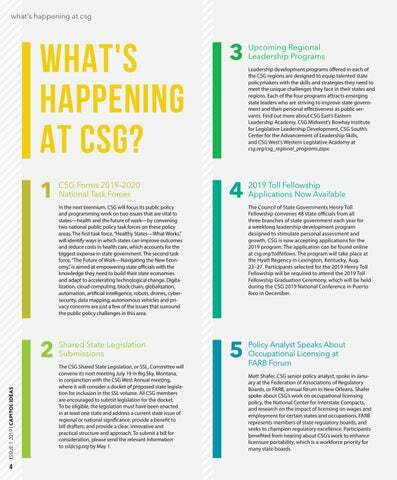 For more information and to apply for the CSG Toll Fellowship, contact tolls@ csg.org or visit csg.org/tolls.